Time to pay some attention to the rear end of my olifant. At this stage I am adding detail to the tail and general rear end. In case anyone is wondering, this isn’t a spelling error, it is Africaans for elephant. There is nothing like trying to copy an animal for gaining an understanding of its real shape. I used about 30 photographs from different angles to understand the true proportions of an elephant. If you trued to sketch one from memory then trust me, you would be way out. Their legs are longer than you think, their heads smaller and their feet pads larger. Photographs, calipers and the ability to scale are vital tools and techniques. 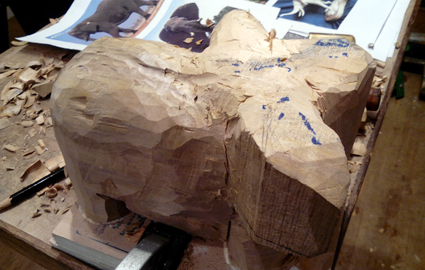 With some carving work you need those odd boosts to the process to show that you are making progress. Here I have added the eyes. 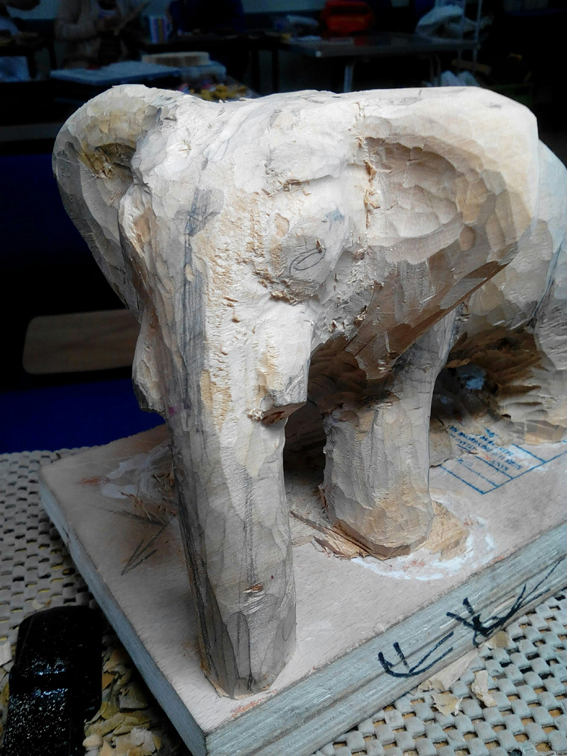 It is really way too early for this level of detail but I wanted to make sure that there was enough wood there and that the mouth, trunk, tusks etc were proportioned to the eyes. Having said all of that I really just wanted to play with some detail. It was also a waste of time because, as I added later body detail, it became obvious that the head was too large, and so the eyes had to go. If you didn’t watch this over Christmas, and you like elephants, then you really should. 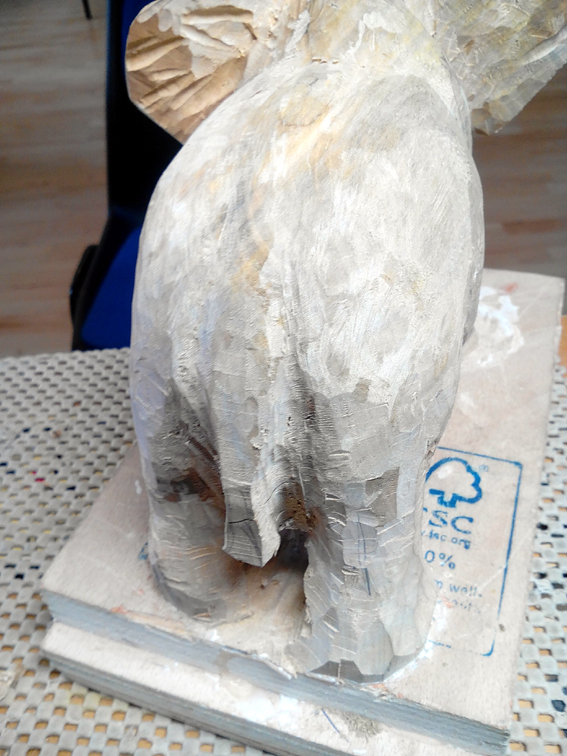 Having roughed out the elephant, this is the stage where work appears to slow down. 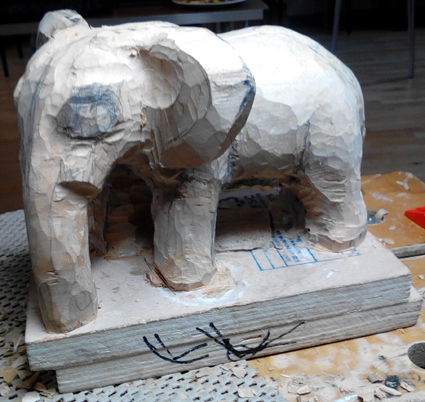 The process of getting the detail into the elephant takes time. Within the roughed out shape you know that, about 1cm down, the elephant lurkes. I am beginning to sketch out the head details first. Day 4. Christmas is now a distant memory. For those less able to plan, or curb the excesses, the fear of the looming credit card bill is growing. The elephant meanwhile is beginning to look the part. In many ways this is the most difficult part. If the legs, ears, trunk, head etc are in the wrong place then there is no way back. I am quite happy that all is ‘dimensionally right’ with this elephant. In case you are interested, it is an African elephant and so has large ears. Day 3 and, whilst some are heading back to work, children are coming down from a 2 day sugar high, and parents are wondering when school restarts. 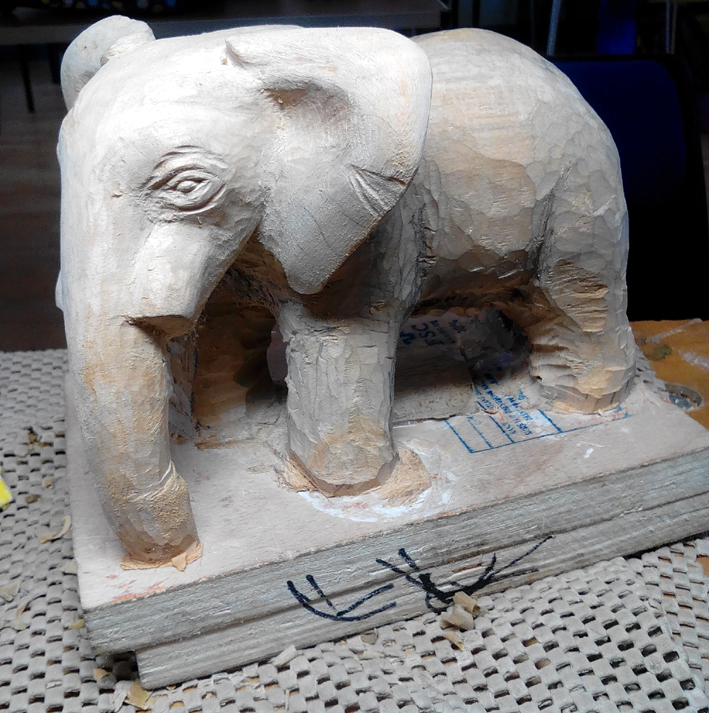 Meanwhile the elephant begins the process of rounding off to create the body shape. We are still in the roughing out stage, where large chisels and a strong hammer are needed.